TechSmarrt, a team of Bredesen Center students developing software that simplifies the process of interpreting the structure of materials for use in industry and pharmaceutical applications, surpassed 12 other competitors to win the fall 2015 Vol Court Pitch Competition on Tuesday, Oct. 20. Eva Mutunga, Christine Ajinjeru, Adeola Adediran, and Akinola Oyedele, all PhD candidates with the Bredesen Center, with Prof. David Keffer of the Department of Materials, Science and Engineering and Dr. Orlando Rios of Oak Ridge National Laboratory, have developed software that streamlines the existing process of interpreting structures of materials. While the current process requires hours on a supercomputer, TechSmarrt’s software enables the same information to be produced in seconds. Better still, the software runs on a standard laptop, further expediting the process of materials discovery. 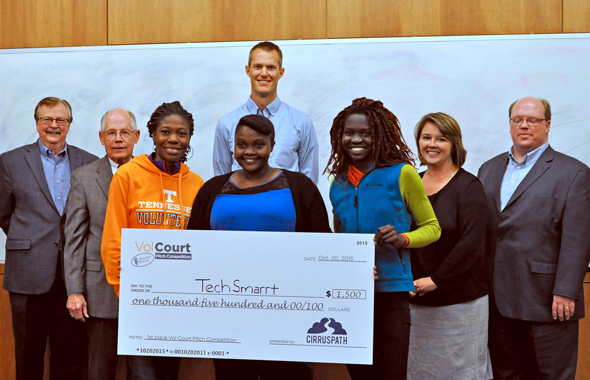 The TechSmarrt team won $1,500, provided by Cirruspath. In addition, the team will also receive one year of free office space in the UT Research Foundation Business Incubator, consulting services courtesy of Pershing Yoakley & Associates, and legal advice courtesy of Morehous Legal Group. The team plans to use the prize money and services awarded to create a simplified user interface for their software and legally establish their company. Second place went to Shahram Zarshenas and Financial Cents, a cloud-based software that allows accountants and small business owners to quickly manage and understand financial statements. Zarshenas, a senior majoring in supply chain management, won $1,000 provided by Cirruspath, as well as six months of free office space in the UT Research Foundation Business Incubator, consulting services from Pershing Yoakley & Associates, and legal advice from Morehous Legal Group. Zarshenas plans to use the money on development ahead of a private beta launch. For the first time, Vol Court awarded a third place prize of $500 provided by Launch Tennessee, and in another first, the judges elected to split that award between two competing students in hopes of encouraging them to collaborate on similar ideas. Zak Coleman, a senior majoring in supply chain management, and Drew Farlett, a junior majoring in mechanical engineering, both pitched mobile phone applications. Farlett is developing a rideshare app that will let students post carpool opportunities to the app, allow other students to join, and provide the driver with a means to electronically collect an already calculated share of gas money from each rider. Coleman is developing an app that allows users to easily post event details to a group of invitees. The judges felt that while both apps would have merit on their own, combining features of the two ideas could greatly expand the target market. The Vol Court Pitch Competition was the final event of the fall 2015 Vol Court Speaker Series. Prior to the competition, teams attended five entrepreneurial lectures covering topics like the Business Model Canvas, legal aspects of starting a business and finding non-traditional funding for startups. Vol Court is a free event hosted by the Anderson Center each fall and spring semester. It is open to UT students, faculty and staff, as well as members of the local community. It’s made possible through sponsorship from Cirruspath, UT Research Foundation, Launch Tennessee, Pershing Yoakley & Associates, and Morehous Legal Group.